A portion of the energy created by a propeller is lost from upward flow. The Whale Tail XL from Davis Instruments is a stabilizer and ski boat fin that takes this wash and powerfully directs it aft. Whale Tail XL's unique hydrodynamic design generates lift for improved acceleration to plane and increased top speed. Waterskiers pop out of the water easier and in less time, and enjoy a flattened wake. With the Whale Tail XL, pitch and roll is decreased. 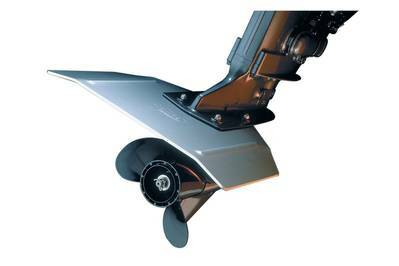 This provides a level, comfortable ride with skid-free turns, especially in rough water. Handling is enhanced with the Whale Tail XL. Bow-light boats are stabilized with reduced porpoising and cavitating. In most applications, owners see better fuel economy. Engineered for use in fresh or saltwater, Whale Tail XL is made from a solid plate of marine-grade aluminum with a durable anodized finish. Installation of Whale Tail XL is quick and easy. It mounts on the anti-cavitation plate of all outboards and sterndrives with the included stainless steel hardware. It costs $69.99.